AN EVENING WITH LIVERPOOL FC LEGEND, JAMIE CARRAGHER. 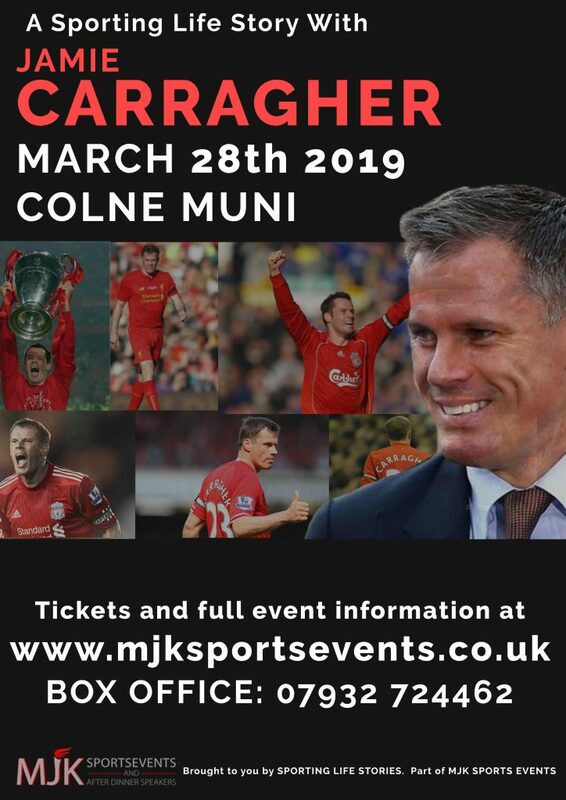 On Thursday March 28th2019 at THE COLNE MUNI, Sporting Life Stories bring you an evening with Liverpool FC legend JAMIE CARRAGHER. Carra will be in town to discuss his amazing career, a career that saw him make an amazing 508 appearances for his hometown club. You will hear it all from the man himself as he is interviewed on stage by Sky Sports very own Pete Graves. The ecstasy of Istanbul with Rafa and the historic treble under Houllier all the way through to the agony of missing out on the premiership. We will hear it all and we will hear it in Carra’s unique style. Our big screens will also be used as we pay tribute to the Liverpool legend with a fantastic entrance video. We have worked with Jamie before and the interview and subsequent Q/A is absolutely brilliant. An unmissable unique event for fans of Liverpool FC. Tickets £35 includes a picture with Jamie that will be printed on the night. THE VENUE OFFERS GREAT VIEWING AREAS NO MATTER WHERE YOU ARE SEATED. Includes a picture with Jamie that will be printed on the night.